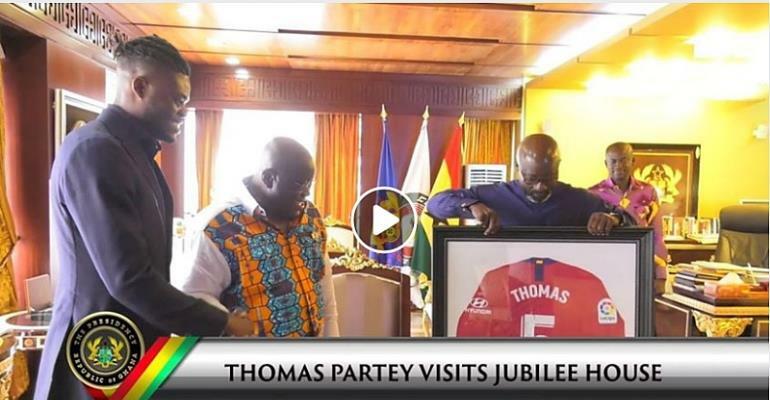 Atletico Madrid midfield kingpin, Thomas Partey has paid a visit to Ghana president Nana Addo Dankwa Akufo-Addo at Jubilee House. Partey was joined by his family and friends at the seat of government. However, the reason behind his visit is unknown but is believed the players are all subscribing to the president idea of winning the 2019 Africa Cup of Nations and are working tirelessly to end the 37 years trophyless drought. The Manchester City target in Accra for two international assignments and played the entire duration in the 1-0 win over Kenya on Saturday.